2 Players stand on either side of the inflatable, so they cannot see their opponent. As each player makes a basket, the ball rolls onto the opponent's side. 1) to see who makes the most baskets in a certain time period. 2) first person to get rid of all the balls on their side wins. 12'l x 8'w x 7'h space and electricity (110 volt, 11 amps). 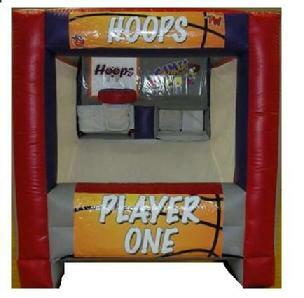 * Please call us with any questions about our inflatable game hoops rentals.